With 96 spooky entries, deciding the winners was especially difficult! The top three, however, are no hollow victories. Halloween is fast approaching, so it’s time to bring out the pumpkins and carve your Jack-o’-lantern! We’re super excited to have Wacom’s support for this challenge – they’re providing several Intuos tablets as well as a Bamboo Duo stylus pen as prizes! For this challenge, we’re providing you with a 3D scan of a pumpkin as a starting point. Download it, open it with your favourite sculpting software and start carving and sculpting! While this challenge is focused on sculpting, you’ll get extra points for adding scary lighting and atmosphere. TL;DR: Download the pumpkin base model, sculpt it any way you like. Publish it on Sketchfab and tag it #PumpkinCarvingChallenge. Work only on the provided pumpkin model – download it from Mieke Roth’s Sketchfab remeshed model (which is based on a 3D scan by Sketchfab team member Maurice Svay). Adding an environment is allowed (ie scary lighting and atmosphere). Submit only new work, but feel free to submit multiple models. Once you’ve created your scene, upload it to Sketchfab, tag it #PumpkinCarvingChallenge. Based on “[Pumpkin](https://sketchfab.com/models/5866a5b13bac4a01918d2b1eb80ad2ff)” by [Maurice Svay](https://sketchfab.com/mauricesvay), licensed under Creative Commons Attribution. Jacob Curtis, Social Media Specialist at Wacom. Wacom’s line of creative pen tablets include a range of choices for your creative interests. The Intuos line up is a great place to start, especially for drawing, sketching and photo activities. You can select an Intuos Art small, Intuos Draw small, Intuos Comic small, or Intuos Photo small. 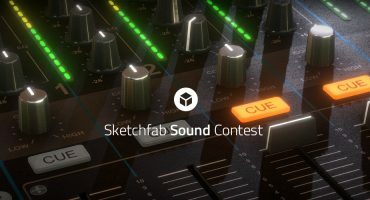 All winners will also receive 3 months of Sketchfab PRO. Contestants models must be uploaded to Sketchfab and tagged with #PumpkinCarvingChallenge to be considered. The winners will be contacted by Tuesday, October 31. Hi guys! few questions. Is this contest worldwide? can I participate from latin america? Yes, you can participate from any country in the world. Question! I am swedish, can I join still? hmm i don’t know what to carve. gonna need to do some sketches first. I’m afraid I can’t help you with that 🙂 Good luck! When you say “Work only on the provided pumpkin model”, are we allowed to deform the shape of this pumpkin? can i retexture the pumpkin? Can we add animations and sound? Or is this a sculpt only challenge? The votes will be based on your sculpting qualities, but you’re free to add animations or sound if you wish. It just won’t get you extra points. Very cool. A jack o’lantern is actually the first thing I ever sculpted in 3D-Coat. It will be fun to do another one. Awesome, am I allowed to take it into max and shell the pumpkin, gotta carve out the insides! Sure, the software doesn’t matter!